Today Simon cooked a luscious risotto with earthy beetroot and sharp, creamy gorgonzola; and a brisket with paprika, brandy and red wine. Proper winter food! 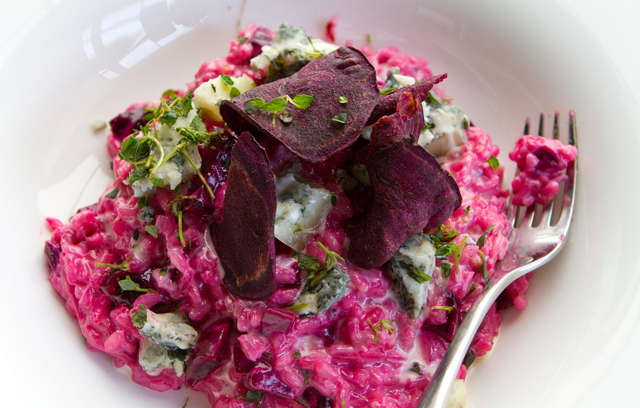 This Beetroot and Blue Cheese Risotto is a delicious midweek meal that’s a great way to use up any leftover seasonal beetroot. The earthy flavour of the beautiful red beetroot is complemented by the rich and tangy gorgonzola cheese, making a deliciously filling dish that is surprisingly straightforward to prepare. Phwoar! Loved Simon’s recipes today – I’m feeling very inspired to do some proper slow cooking this weekend. Here are the recipes.